Cayman is an alternate spelling of caiman, a reptile in the same family as the alligator. On the same day that the first Porsche Cayman arrived at dealerships for sale, Porsche adopted four caimans at the Stutgart’s Wilhelma Zoo. 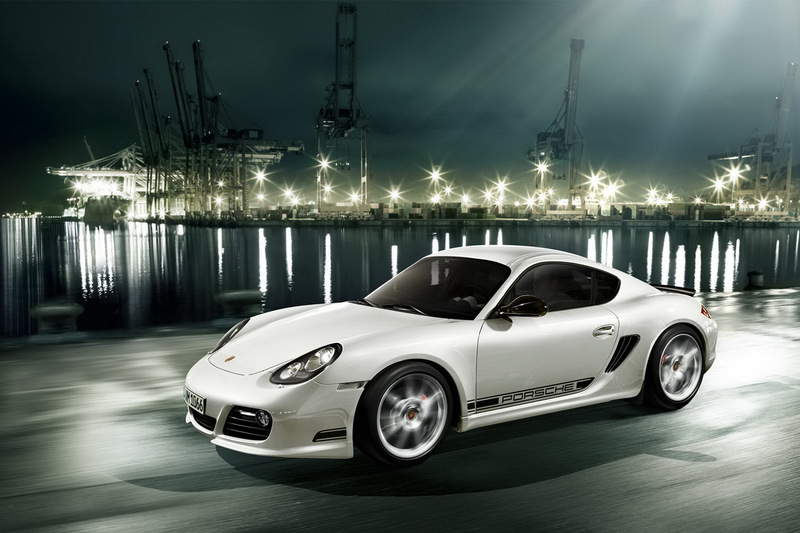 The Porsche Cayman is a mid-engined, rear wheel drive 2-seat sports car produced by Porsche AG of Germany. First launched in the 2006 model year, the Porsche Cayman is a coupé derived from Porsche’s second generation Porsche Boxster convertible. Like the Porsche Boxster, most Porsche Caymans are assembled in Finland for Porsche by Valmet Automotive (the rest are assembled in Zuffenhausen near Stuttgart, Germany). Porsche’s Deputy Chairman, Holger P. Haerter confirmed that their contract with Valmet Automotive will end in 2012, and the Porsche Cayman’s production will be outsourced to Magna Steyr Fahrzeugtechnik of Graz, Austria. After two years of development, the first model of the coupé to be released was the Porsche Cayman S (type 987.120). 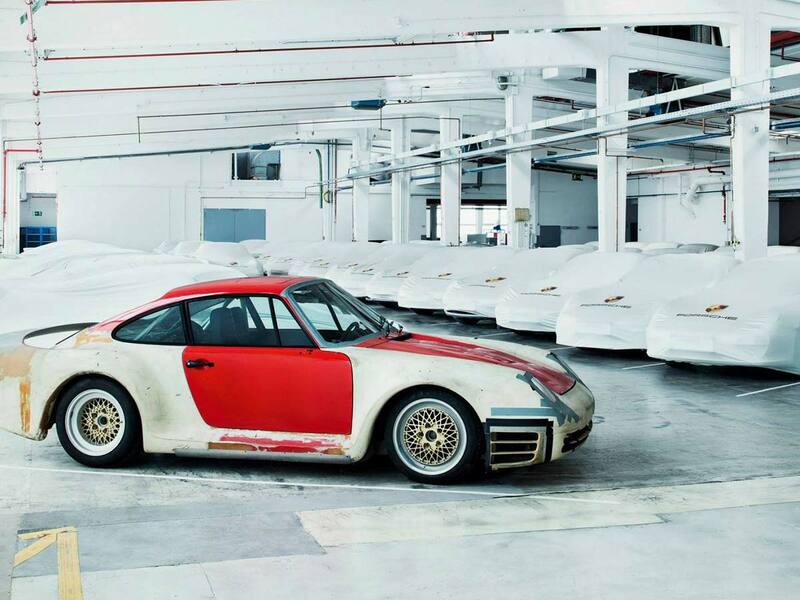 Photographs and technical details were released in May 2005, but the public unveiling did not take place until the September Frankfurt Motor Show. The S suffix (for Sport or Special) indicated that this was a higher performance version of a then unreleased normal model. That model, the Porsche Cayman (987.110), went on sale in July 2006. A motorsport-tuned model, the Porsche Cayman RS, is rumored to have been tested at the Nürburgring that same year. The Porsche Cayman coupé (project 987c) and the second generation Porsche Boxster convertible (project 987) shared the same mid-engined platform and many components, including the front fenders and trunk lid, side doors, headlights, taillights and forward portion of the interior. The design of the Porsche Cayman’s body incorporates styling cues from two classic Porsches; the Porsche 550 Coupé and the Porsche 904 Coupé. Unlike the Porsche oxster, the Porsche Cayman has a large hatchback for access to luggage areas on top of and in the back of the engine cover. The suspension design is fundamentally the same as that of the Porsche Boxster, but features revised settings appropriate to the increase in chassis stiffness resulting from the Porsche Cayman’s fixed roof. A 5-speed manual transaxle is standard on the normal Porsche Cayman (G87.01), while a 6-speed manual (Getrag 466) is the default for the S (G87.21) and an option on the normal (A87.20). An electronically controlled 5-speed automatic transaxle (Tiptronic) was also available on the S (A87.21) and the non-S version (A87.02) (The 2009 models replaced this option with a seven-speed “PDK”, Porsche’s dual-clutch robotic manual transmission). Other options include active shock absorbers (Thyssen Krupp Bilstein GmbH’s DampTronic, rebadged as PASM by Porsche), ceramic disc brakes (PCCB), xenon headlights and an electronically controlled sport mode (Sport Chrono Package). The Porsche Design Edition 1 is a Cayman S model designed by Porsche Design, commemorating the 35th anniversary of Porsche Design. The all black car features a black full leather interior including seats, dashboard, and door trim as well as black Alcantara steering wheel, gear change lever, handbrake grip, and headliner. The DE1 also is fitted standard with the Porsche Active Suspension Management (PASM), 19-inch Porsche 911 (Porsche 997) Turbo wheels with 235/35 ZR 19 front and 265/35 ZR 19 rear tires, unique Porsche Design script on the instrument dials, stainless steel entry plate engraved with “Porsche Design Edition 1”, all-red rear taillights, custom vinyl exterior black-on-black graphics, and a numbered plaque on the glovebox cover. As with all PASM-equipped cars, the body is lowered by 10 mm (0.4 in). Standard equipment includes an elegant briefcase containing the Flat Six Chronograph, a pocket knife, a pair of sunglasses, a pen, and a key ring – all in black, even the knife blade. 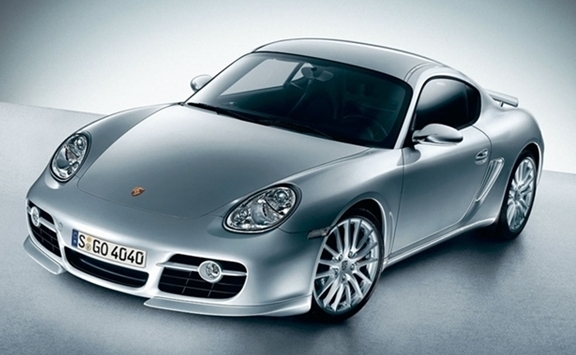 777 Porsche Design Edition 1 vehicles were produced as 2008 models. It went on sale on November 2007 in Germany, followed by the US in January 2008. Base price is 58,600 Euros and USD 69,900 in the U.S.
Porsche also announced the production of a limited edition Porsche Cayman S Sport, to be available in October 2008 as a 2009 model. It features a freer-flowing, louder, exhaust, which raises power from (295 PS (217 kW) at 6250 rpm to (303 PS (223 kW) at an identical 6250 rpm. The Porsche Cayman S Sport comes in Bright Orange and Signal Green (from the Porsche 911 GT3 RS), as well as Carrera White, Speed Yellow, Guards Red, Black and Arctic Silver. The Porsche Cayman S has striping on the sides, black 19-inch wheels and an Alcantara steering wheel directly from the 911 GT3 RS. The instrumentation loses its hood. The body is lowered by 1 cm. 700 were to be made for the worldwide market. The second generation of the Porsche Cayman was introduced on 21 February 2009. The standard Cayman engine’s displacement was increased from 2.7L to 2.9L, giving a 20 hp (15 kW) increase to 265 hp (198 kW), while the Porsche Cayman S gained direct injection and a 25 hp (19 kW) increase to 320 hp (239 kW). Both the Porsche Cayman and Cayman S maintain a 10 hp (7 kW) power advantage over their roadster sibling, the Porsche Boxster. On the front end, each has its own design for the front bumper. The front signal lamps are designed differently: while both use LED signal lamps, the Porsche Cayman’s LED are arranged like the face of dice while the Porsche Boxster gets a horizontal row of 4 LEDs. The Porsche Tiptronic S automatic gearbox was replaced by the 7-speed PDK dual clutch transmission for the new model. The PDK outperforms the manual transmission with a 0-60 mph time of 5.4 seconds versus 5.5 seconds for the manual. The PDK with the sport button option lowers the 0-60 mph time to 5.2 seconds. Also a limited slip differential is now a factory option. In November 2010, Porsche announced Cayman R. Cayman R, is 121 lb lighter and has ten more horses than the Porsche Cayman S.
Outside, Porsche has fitted the Porsche Cayman S with new 482-millimetre lightweight wheels, and aesthetic tweaks like a subtle stripe package, contrasting-color mirrors and black-accented headlight bezels . New Porsche Cayman R is powered by a tuned-up 3.4 liter six-cylinder engine, develops an impressive 330 horsepower. In the standard configuration it transmits its power to the rear wheels via a six-speed manual gearbox. The the speed from 0 to 60 mph, now made in 4.9 seconds (or 4,7 seconds with the optional Sport Chrono packages) and the top speed of 175 mph with manual gearbox, or 174 mph with PDK. In 2011 Porsche unveiled Porsche Cayman S Black editon, which benefits from a power boost and additional standard equipment. The Porsche Cayman S Black Edition toes the same line as the Porsche Boxster S Black Edition and Porsche 911 Black Editions by offering the Porsche Convenience package as standard equipment. Limited to 500 units worldwide, the Porsche Cayman S Black Edition features an upgraded version of the 3.4-liter six-cylinder boxer engine, with output increased by 10 horsepower to 330HP at 7,400 rpm (200 rpm higher). Maximum torque remains unchanged, however, at 370 Nm (273 lb-ft) at 4,750 rpm. 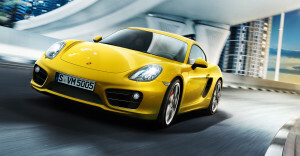 Porsche has unveiled the new generation of Porsche Cayman at L.A. Autoshow 2012. 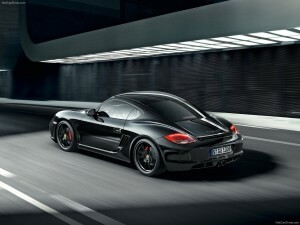 Porsche’s new design language seen on the Porsche Boxster has been carried over to the latest Porsche Cayman. Hi, Is there a Facebook-Like link for this article? I just can’t see it!